The distinguished Rum Line completed a 1.5-year overhaul in the Casa Vieja Marine Services Boat Yard and debuted on October 25th. Casa Vieja Lodge selected to repower the Rum Line with twin Cummins QSC 8.3 Engines (500hp), replacing the previous mechanical version. “With these newer electronic engines she won’t blow black smoke while you are backing down on a big one, be much more fuel efficient, have a higher cruising speed of 25 knots, and frankly overall are a perfect match for this 40′ Gamefisherman,” said Captain/Owner David Salazar. She came out the yard dazzling with all new electronics, generator, teak deck, mezzanine seating, dining table and other small details that make her shine. Capt. Chris Sheeder loves the user-friendly SIMRAD NSS evo2 12-inch. “To make my job even easier, it comes with a built-in CHIRP-enabled broadband sounder to help me find the fish!” said Capt. Chris with a chuckle. 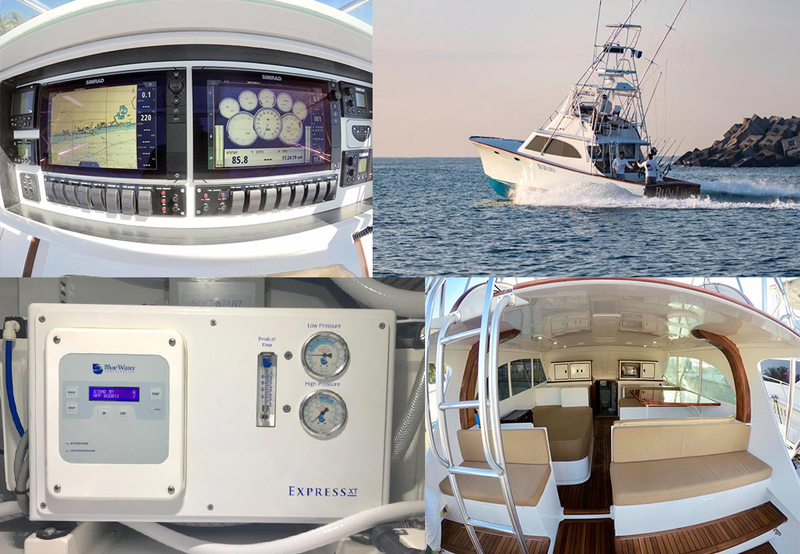 Salazar also selected the Blue Water Desalination Express XT Compact 800 GPD fully-automatic water-maker for the Rum Line, as he previously installed the same one in the Finest Kind and water rationing is a thing of the past while aboard these two boats. The Rum Line debuted in her first tournament back placing 2nd in the No Sancocho Sailfish Shootout with Team Merman: Kristen Salazar, Owner; Elisa Badillo Sheeder, Lodge Manager; Kirsten Thomas, Reservations Manager; Capt Rick Murphy, Celebrity Angler. So if you were wondering, yes that boat still raises fish, and yes your Casa Vieja Lodge female staff can catch them! The 2018 No Sancocho Sailfish Shootout was held November 8-10that Casa Vieja Lodge. This is the annual in-house tournament presented by Casa Vieja Lodge which makes you put your money where your mouth is, as each Sancocho, or missed bite, results in a $20 donation to charity. Anglers choose the combination of bait and fly casting that they think will earn the most points. In 3 days of fishing, 11 boats released 389 billfish and had 261 sancochos. At the heart of this tournament are camaraderie and charity. Nightly activities consisted of casino night, Karaoke and Carnival games, as well as the Twisted Tilapia Tournament! At the awards ceremony, over $40,000 was raised from the sancochos and generous donations from anglers. Neptune Impact Windows also pledged to match all sancocho monies at the start of the tournament, a very brave move knowing Guatemala’s exciting fishery! A special thank you to marine artist Carey Chen who live painted and donated his art for auction which sold for $11,000. 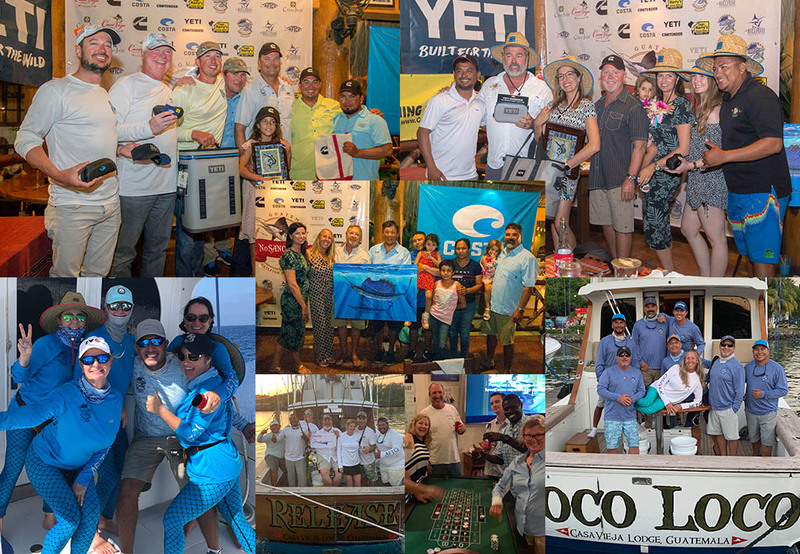 A big thank you to all sponsors: Cummins, Costa Sunglasses, YETI, AFTCO, Contender Boats, Sportsman Adventures, Capt Harry’s Fishing Supply, Casa del Jade, and The Billfish Foundation. Traditionally monies raised go to schools in the local town of Puerto San Jose as over the year’s monies raised have built walls, roofs, running water, auditoriums, and 100 new school desks. This year is different as the money first will go to a procedure for 10-year-old Natasha Ramirez, the daughter of Poco Loco first mate, Johnny Ramirez, who was diagnosed with a desmoid tumor on her left leg. All local doctors have said to amputate; however, Johnny has found a doctor that would like to save her leg, and he couldn’t be happier with this gleam of light. “Johnny is part of the Casa Vieja Lodge Family and we need to help our family first.” said Capt. David Salazar. Natasha and her family joined all anglers for dinner at the awards ceremony and the good news was announced: The money raised will help alleviate all medical bills, and expenses for her procedure in Mexico! 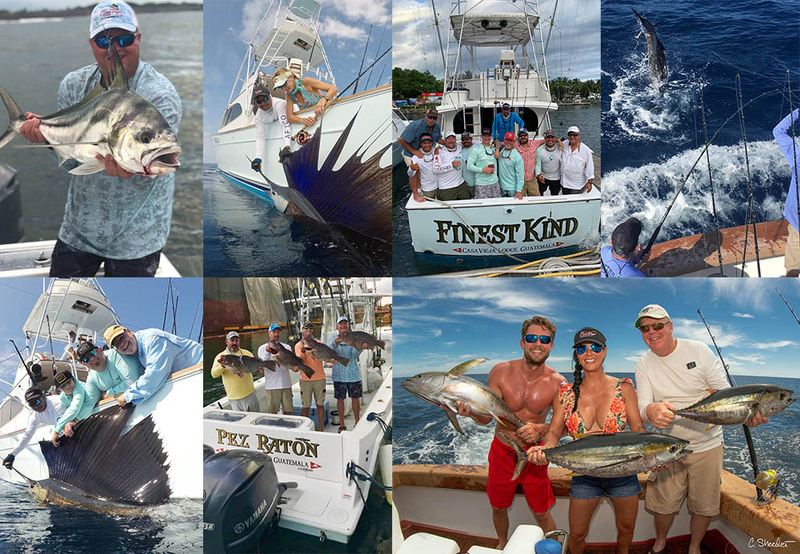 Join us next year for the 2019 No Sancocho Sailfish Shootout November 7-9th. We all know the Sailfish is the fastest in the sea, but this weekend at the NASCAR Championship Race we are Team Mahi thanks to Local Knowledge and the StarCom Racing/Superior Essex NASCAR Racing team. 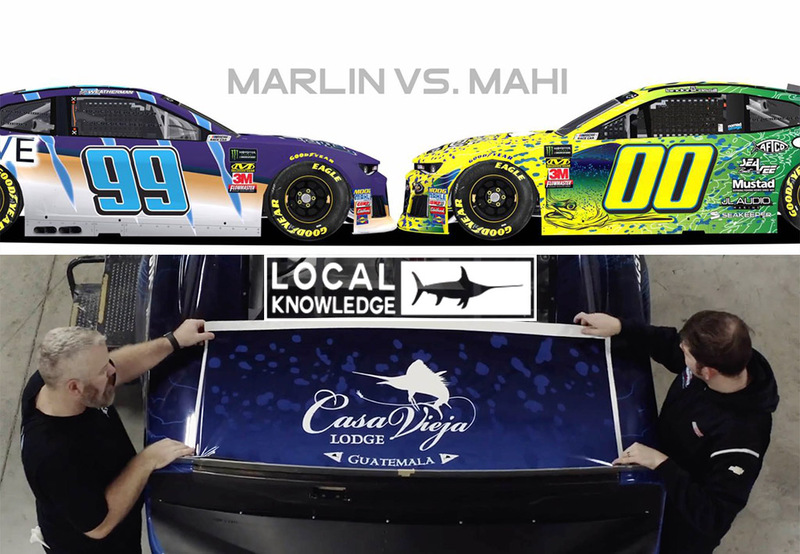 The Local Knowledge 00 car, driven by Landon Cassill featuring the new Mahi Mahi graphics package, will compete head-to-head with the Superior Essex 99 car driven by Kyle Weatherman and sponsored by International Marine. Kyle’s 99 car will feature a blue marlin graphics package for the 2018 Ford EcoBoost 400 race. The teams have coined the race “The Marlin vs. Mahi Championship”. The race will be televised live on NBC at 2:30 PM ET on Sunday, November 18th, and Local Knowledge will air the NASCAR episode in April 2019 with the start of Season 4. I spy Casa Vieja Lodge on the Mahi tail, check it out HERE. While October fishing played with our emotions, the November fishing has been doing the same but with higher averages, and much more blue marlin in the waters than we are used to this time of year, but we surely aren’t complaining! A few of our familiar IWFA ladies made their trip down for some great fishing, and also brought goodies to donate locally, toothpaste, toothbrushes, hairbrushes, soap, as even a little goes a long way here. Thank you Ladies! If you’re a fan of Capt Rick Murphy then CVL has been the place to find him as he’s visited us in October, November, and will be here again in December, and January too. Someone name a couch after him please! November 1st-14th, the Rum Line (40′ Gamefisherman) with Capt. Chris Sheeder, had 149 raises, 109 bites, and 82 sailfish releases plus 10 marlin raises, 4 marlin bites, 3 marlin releases, and 48 mahi-mahi. November 2nd-12th, the El Cadejo (35′ Contender) with Capt. Benji Bairez, had 104 raises, 85 bites, and 53 sailfish releases plus 4 marlin raises, 1 marlin bite, 1 marlin release, tuna, and 29 mahi-mahi! November 2nd-13th the Poco Loco (44′ Kincheloe Nickerson) with Capt. David Salazar, had 164 raises, 143 bites, and 94 sailfish releases plus 12 marlin raises, 4 marlin bites, 1 marlin release, 1 tuna, and 29 mahi-mahi. November 2nd-13th, the Makaira (37’ Rybovich) with Capt. Jason Brice, had 128 raises, 121 bites, and 84 sailfish releases plus 11 marlin raises, 9 marlin bites, 2 marlin releases, and 50 mahi-mahi. November 2nd-13th, the Spindrift (38’ Stolper) with Capt. Efron Rizzo, had 134 raises, 117 bites, and 96 sailfish releases plus 2 marlin raises, 2 marlin bites, 1 marlin release, and 31 mahi-mahi. November 2nd-13th, the Afinity (39′ Billy Knowles) with Capt. Nico Melendrez, had 139 raises, 125 bites, and 85 sailfish releases plus 3 marlin raises, 2 marlin bites, 2 marlin releases, 2 tuna, and 23 mahi-mahi. November 2nd-13th, the Finest Kind (40’ Whiticar) with Capt. 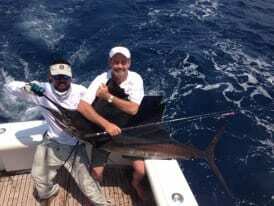 Nicho Alvarenga, had 134 raises, 117 bites, and 94 sailfish releases plus 8 marlin raises, 7 marlin bites, 3 marlin releases, 3 tuna, and 29 mahi-mahi. November 8th-10th, the Pez Raton (35′ Contender) with Capt. Franz Hoffman, had 69 raises, 59 bites, and 32 sailfish releases plus 2 marlin raises and 3 mahi-mahi! November 8th-13th, the Release (37′ Merritt) with Capt. Chico Alvarenga, had 125 raises, 107 bites, and 74 sailfish releases plus 9 marlin raises, 8 marlin bites, 3 marlin releases and 15 mahi-mahi! November 8th-14th, the Intensity (37′ Gamefisherman) with Capt. Mike Sheeder, had 106 raises, 92 bites, and 66 sailfish releases plus 7 marlin raises, 2 marlin bites, 2 marlin releases, and 8 mahi-mahi. You can always check out our daily fishing reports on our website HERE.